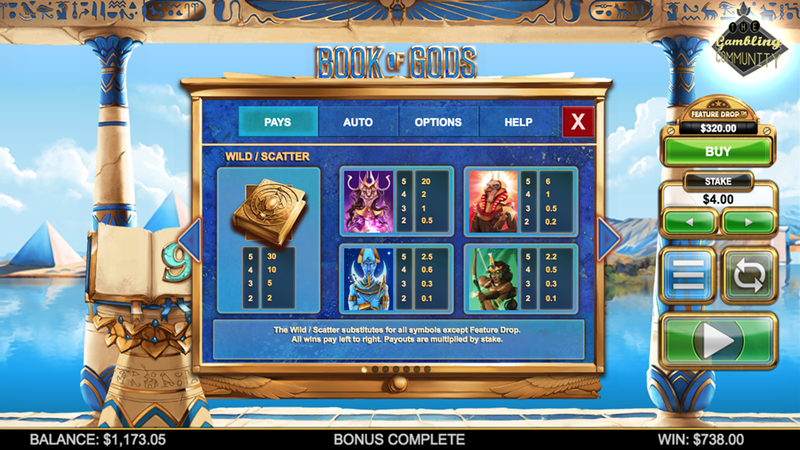 Its an exciting day today, Big Time Gaming have released another new slot and this time it features a familiar theme that revolves around a sacred book and expanding symbols, think book of ra with 243 ways and then chuck in the magic mirror feature that allows you to have more than 1 special symbol in the bonus, add the option to buy the feature for 80x and cloning symbols in the base game and you have the blueprint for the new Book Of Gods. Lets get stuck in and see if it lives up to the BTG hype! 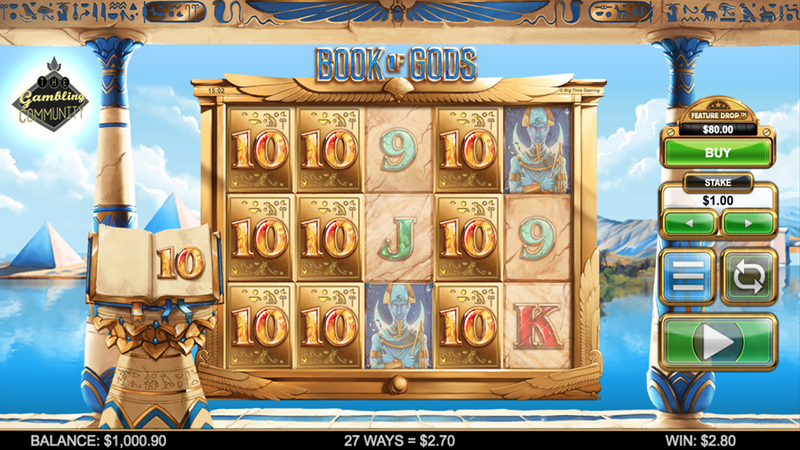 Book Of Gods is a 5 by 3 reel setup and plays with 243 ways rather than fixed lines. The theme is based around four Gods and the cloning symbol feature, every spin in the base game theres a book that will choose a low paying symbol from 9 to Ace and any of those symbols that land will expand and award the win as you can see below. 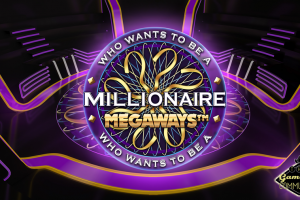 I think this is a nice extra as we all like expanding symbols, that’s the main reason we play these book games, however you’re not going to win a huge sum even with a full screen as its only the lower symbols until you get into the bonus. The freespin feature is either awarded by landing at least 3 of the scatters which also act as wilds or purchasing with the feature drop button for 80x your total bet, For 3 scatters you get 15 freespins, 4 gives you 20 and 5 scatters gets you the max of 25 starting spins. 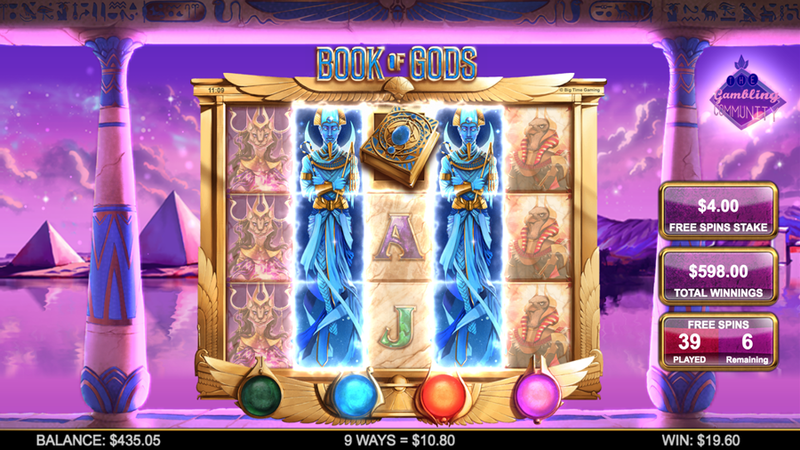 Once the bonus starts the book flicks through the 4 gods and chooses your symbol, during the bonus this symbol will expand exactly like in book of dead or book of ra. The twist is that you can get unlimited retriggers and each time you do you get another god to add to your list of expanding symbols, you can see below I had the blue, red and purple god unlocked as each of the corresponding orbs below the reels where illuminated. Each trigger was 3 scatters which gave me a running total of 45 spins, out of interest the total win was just shy of 200x which I thought was pretty disappointing, lets take a look at the paytable and see where the potential is. The paytable lists the wins as multiples of your stake, with aces being the best paying low symbol you get 2x for a full way this means a full screen in the base game would pay 486x your stake and is the largest win possible in a base game spin. Not too bad for a book series game as the explorers in the similar games pay 500x for a 5 of a kind. The premium god symbols pay slightly better if you get the green or blue one but just like Bonanza and Extra Chilli the true potential lies with the top symbol, in this game that is the purple goddess of the afterlife. She pays 20x for a full way and in the bonus with a full screen you would win 4860x your stake which is very nice. The God of ra in red would pay 1458x, the blue God of the moon pays 607.5x and the green Goddess of the earth pays 534.6x which is only slightly better than a full screen of Aces in the base game. 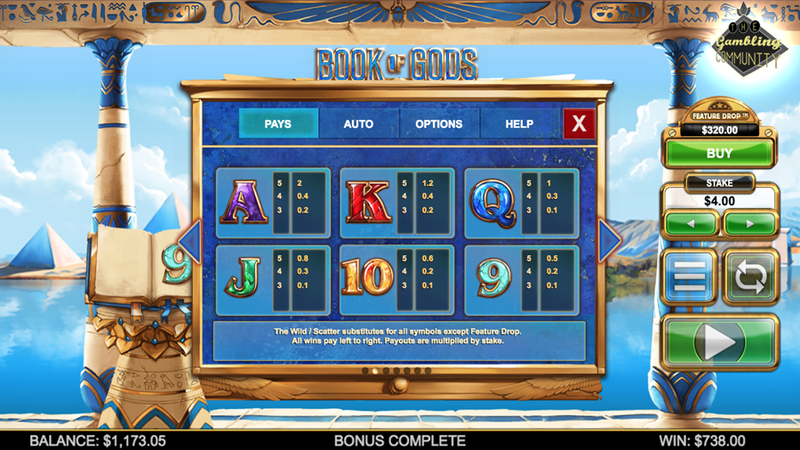 Considering you can have all 4 Gods expanding in the bonus and to do so would give you at least 60 freespins the potential is there for some gigantic wins, I didn’t experience any myself while testing it and I played at least 20 features, some of the worst paying as low as 10x. 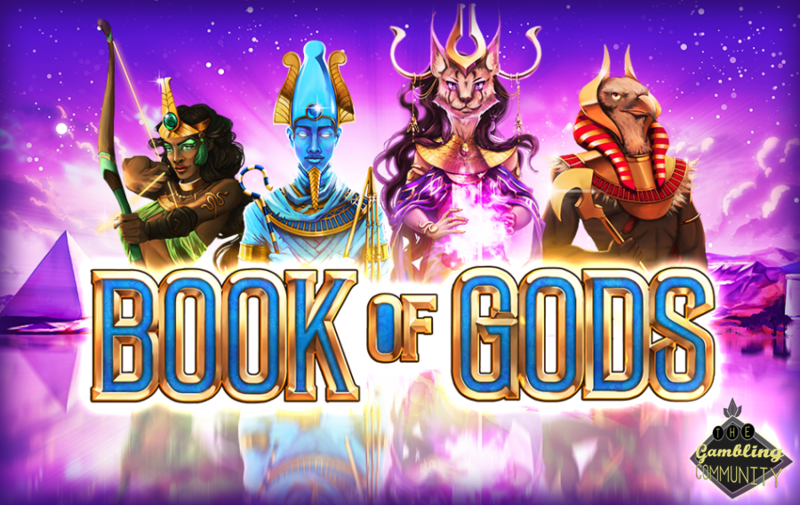 Book of Gods has an RTP of 96.35% and I would rate it as high variance, the graphics and sounds were the usual high standard you expect from BTG and I did enjoy playing it, Id rate it much higher than Temple Quest Spinfinity but still not in the top 3 from BTG with DHV, Bonanza and Extra Chilli. 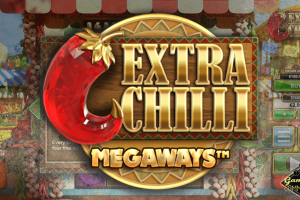 It just didn’t pay as well as some of the screens looked when they landed which was a bit deflating, I like the slow roll feature that we have become accustomed to with BTG games and I was pleased to see that they included it in this too. Overall Id say its one I will play and Id happily recommend to others if your looking for something new to play. 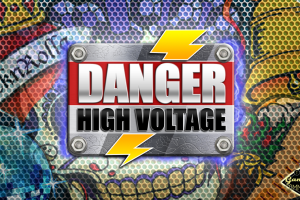 Its general release is on the 13th of June and I will update this review with a link below so you can play it, for now though its only available at GVC outlets, as always thanks for reading and make sure you check out the forum below if you haven’t already!